A repeating geometric motif composed of triangles, hooks and a central diamond is arranged in diagonal rows, with a line of triangles above and a border of geometric plants below. The diagonal rows alternate in colour between pink and brown. 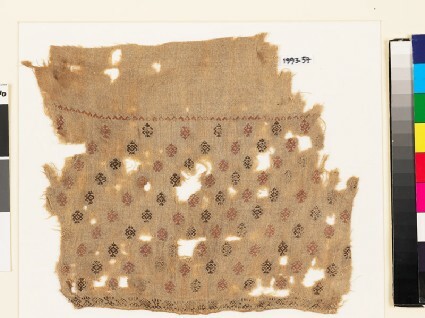 The design forms a wide band which has a fine pink border of inverted V-shapes along one side, and a brown band with mostly disintegrated geometric designs along the hem line. There is a finely rolled hem. The fragment probably was part of a tunic.